Thirteen years after "Infernal Affairs", the godfathers of black industrial returns with a new release that could arise every sort of doubt about how time affected their music. "Ulvens Broder", the EP which has anticipated this release, hinted an evolution towards a more layered, and subtle, sound in place of the harshness at the core of their classic album. "Svartmyrkr" is surprisingly an evolution towards a more atmospheric musical framework where noise has a restrained, but important, place. The field recording of a fire pit opens "Äntra Helstraffet" which evolves in an evocative soundscape made out of sample, sparse drum beat and distorted vocal and ends in an explosion introducing this release. The pounding beat of "Öppna Hegrind" is almost hidden by the haunting screaming and the noises used as elements of a soundscape instead as bricks of a wall. "Codex Mendacium" is a crescendo where noise emerges from a quiet drone. "Ulvens Broder", which anticipated this release, is confirmed as the track which condense the musical elements of this release. "Helblar" is an interlude which seems quiet as uses sustained tones, instead of noises, and resonances. "Ulvens Bleka Syster" features fast string, closer to the ones used in sound tracks to mimic the exiting of bats from a lair, and abrupt stops. "Burn Your Temples, True Change" is quiet a metal track, as it's based on acoustic and electric guitar, and reveals the aim of the band to find new way of expression. "She Who Offers Sorrow" is a return to the noisy assault of their first albums while "We Are Eternal" sound as their version of neofolk with its acoustic drum, the trumpets and the epic atmosphere. "Lokastafr Ablaze With The Thorns Of Death" closes this release with an suspended atmosphere using drones, drums and sparse noises. A lot of bands would simply exhumed their old sound to please their old fans placating their nostalgia. Ulvtharm, Nordvargr and Drakh have instead decided to move their sound one step towards other territories using crafts instead of impact. Highly recommended. We already introduced this multi-international Electro-/Metal-Crossover-project almost 5 years before with its debut "Visions of the Blinded World pt. I". So this new double-CD is the follow-up release presenting again the reworked debut album plus the new and second chapter of their "Visions" release series. Spookshow Inc. is a productive trio consisting of the Norwegian-based mastermind Lucky Spook (composing & production) and his two Lithuanian-based comrades Soltex (vocals) and Sharaz (drums / bass). Musically relying on idols like Rob Zombie, Skinny Puppy, Die Krupps or The Prodigy this trio creates a multi-facetted outfit which is a bit challenging to describe properly. And with all respect to their wide-ranging musically horizon, any comparion to the before mentioned global players would be unfair. While the second part of their "Visions" trilogy has been produced between 2014 to 2018 and mastered in Vilnius, LT, it is also worth to have a detailed look back on the first part. Part I has been received two new bonus tracks with "Seven Trumpets", a true epic Industrial-Metal gem and "Lizard Eyes", which also allows some relaxing but still thrilling moments. Two further tracks received a rework treatment, "Game of Delusion" has received a new chorus, while "Dead Shot Baby" has been extended and revamped in collaboration with the US-based Subliminal Mentality. Still all good and quality stuff presented on here and the more I listen to it the more it becomes familiar. Nevertheless my main interest belongs on the new second part of "Visions of the Blinded World". 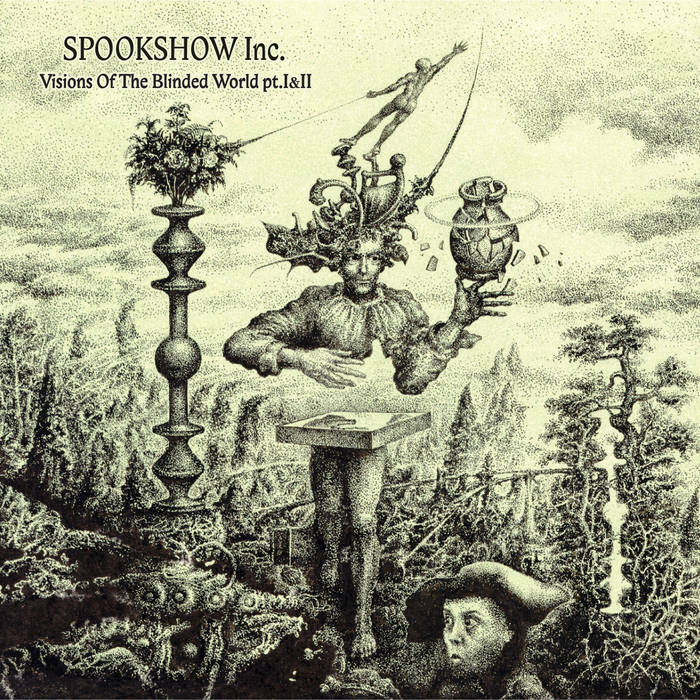 While continuing their musically expression into the wide field of Industrial-Metal music, it it obviously and easily recognizeable, that Spookshow Inc. have developed in their style. To me their newer tracks come out more matured and their more experimental textures somehow are fitting better and better. "Virtual Insanity" starts of with pumping breakbeats and Soltex' angry vocals. "Devil's Triangle" also warms the Industrial-minded heart with its grinding guitar riffs, while "Mindgame (feat. XRC)" leads into a more darker, experimental-oriented outfit with some chirpy acoustic-guitar inserts. Yes, their more experimental-minded tracks, which also vary between tempo and mood, show their real talent and potential behind this project. "Prison Planet" is another bright example which slanders between mysterious sample-work, various different rhythmic elements and multiple vocal inserts. "Falling Down pt I" is to my surprise featured on this newer second album, while the part II of this track was to me one of the highlights on the first "Visions of the Blinded World" album. As for naming another highlight, "Match of the Century / A. Crowley vs. A. Einstein" describing a virtual chess game between the both protagonists comes easily to mind. "Visions of the Blinded World pt. I & II" in its beautiful-styled DCD package isn't your typically Industrial-Metal album to use as your daily background noise. It is much more! It is a challenging adventure into quite different moods which this music style has richly to offer and it needs a bit time and attention of the lsitener to be able to pick-up only a glimpse of the content. A fabulous spookshow, gentlemen, keep it on! M. Slagle (M for Matt) has been involved over the years with projects such as Side 3, Negativehate, Navicon Torture Technologies, Diathoron, Sullen Rail, Thevetat, Theologian and Dracaris. He's had several releases previously, but this is the second under his own name on the Spent Decibel label. I know that some of the projects he's been involved with are of the dark ambient/noise/power noise genres, but here on 'The Endangered Consciousness' it's electro-industrial all the way. The music (consciously or unconsciously) owes a debt to acts such as Frontline Assembly, Skinny Puppy, Haujobb and the like, while not attempting to imitate them. The thirteen tracks on this album remind me of a time in the 1990s when a whole new crop of electro-industrial artists were entering the scene, such as Index, Fenton Feckler< Gridlock, Battery, Crocodile Shop, Heavy Water Factory, Razed in Black, and too many more to mention. The music is predominantly synth-sequencer driven, full of old-school sounds that are going to take you back a couple of decades. It's the kind of industrial style you just don't hear much of anymore. One of the highlights of the album is a fairly faithful cover of Maryann Faithfull's "Love Hates" from 1995. (Haven't heard that one in a while.) Slagle's vocals are pretty decent in that raspy electro-industrial mode, also adding some atmospheric backing "ah ahh aaahs". Although that isn't the only song with vocals, it would have been nicer if there were more throughout the album. The tracks are certainly short enough to warrant them (none being excessively drawn out instrumentals) and likely would have infused a more human aspect into the synthetic machinery. Even though some of those aforementioned influences spend large chunks of their albums in instrumental impetus and atmosphere, most of their tracks feature vocals. It's the glue that sticks subconsciously in the mind of the listener and deserves a more prominent place in the music. Besides the elaborate synth sequencing, the crunchy beatwork also deserves a mention. 'The Endangered Consciousness' is one of those albums that you may have to listen to more than a couple of times to appreciate, and I know that in this age of instant gratification it may be asking a lot, but still there is some reward here. 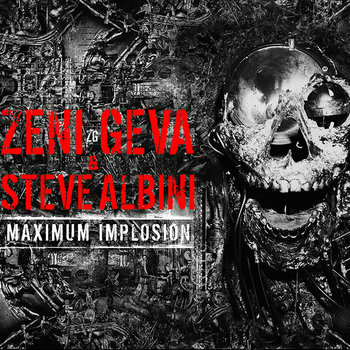 This double cd collects all pieces between Zeni Geva and Steve Albini: the EP "Nai-Ha" and "All Right, You Little Bastards!" a live recording in Tokyo and Osaka. The contribution of Steve Albini, to the heavy form of rock which is the mark of KK Null, is the clean and dry sound which is typical of his recordings and the insertion of more meditative moments in the assault of the japanese band. This could easily be heard in the second section of "Autobody" or the first section of "Angel" which features also the guitar of Steve Albini. The other track are based on a vision of heavy metal where hammering rhythm and distortion create a sonic wall that never degrades into noise. As a bonus the two tracks of "Superunit", with Albini on guitar, are included where there's a perceptible shift toward the indie rock form which is typical of Albini's music so it's slower and more varied. The second cd is a live with Albini as a member of Zeni Geva featuring also track from the first cd and where there's a more energy and less sound details with the result that is enthralling in some moment in a peak by the cover of "The Model" by Kraftwerk in which with acuity sounds as a Zeni Geva track while retaining the pop allure of the original. This is a reissue of material that has never produced a school or a genre but has had various little influences in a wider musical perspective than heavy metal and indie rock. It was never ground breaking but has that kind of personality that from the first notes, the listener knows who are the players. Absolute respect. Chmcl Str8jck (Chemical Straightjacket for the phonetically challenged) are the electro-industrial duo of Kevin Snell (keys, programming, vocals) and Mike Cairoli (guitar) from somewhere in northern New Jersey. Hey! I used to be from somewhere in northern New Jersey, but nearly a lifetime ago... Anywho, this self-titled 8-track album (that's an album of 8 tracks, not released on 8-track tape, although that could have been interesting) is their debut , released July 4, 2017. Yeah, I know we're really getting to this one late; it was one of the many that sat at Chain D.L.K. Central (Marc's domain) until enough material piled up that it had to be doled out to us lucky reviewers. So what have we got here? Well, this is pretty basic stuff with some good twists that comes across like a quirky sort of EBM (simple) without trying to be the next dancefloor killer. Effective but nothin' fancy synth programming and beats with str8t-ahead industrial guitar adhere to the KISS (keep it simple, stupid) rule. In the vocal and lyric department Snell co-opts Revco, Marilyn Manson, Alice Cooper, Jello Biafra, Skinny Puppy, etc., etc, with a sardonic sense of humor, which makes this thing seem to work better than it ought to. It's a horror-tinged cyber-punky sort of industrial with processed voice that is more spoken than sung, but somehow still works well. I saw the video for "Dressed to Kill" (the song that opens the album) and it's like Devo meet Ministry in Ed Gein's back yard. (No joke!) Some of it was filmed at a pole-dancing club called Platinum Dollz (Passaic, NJ) and although the vibe is uber-creepy misogynistic ritual killer stuff that might turn off some folks, for me it seemed ridiculously over the top enough to be chuckle-worthy. On the other hand, a different YouTube video of the band playing live proved to be somewhat of a yawn. Guess they need to work on their live presentation to kick it up a notch or three. The songs on the album still have a certain strange fascination though, although their next venture could probably use some diversity.